The CHATILLON® DFX is an economical digital force gauge ideal for applications where users are interested in basic peak force measurement. The Chatillon DFX digital force gauge is available in four capacities (10lbf, 50 lbf, 100 lbf, 200 lbf) and features an integral loadcell with a measurement accuracy of better than 0.5% full scale. The Chatillon DFX operates using two (2) 9Vdc alkaline batteries or using the standard battery eliminator. The battery eliminator is supplied with a US, UK and EURO style plug. Under battery operation, the DFX Series will operate for over 120 hours of continuous use. A large, easy-to-read, high resolution dot matrix LCD display supports a variety of standard gauge functions including normal and peak readings. Loads are displayed in ozf, gf, lbf, kgf and N units. The display language may be setup to indicate in English, Spanish, French, German, Portuguese and Chinese. The Chatillon DFX digital force gauge’s calibration procedure in included in the gauge’s setup. The DFX Series force gauges come with a carrying case, battery eliminator, flat and hook adapters. 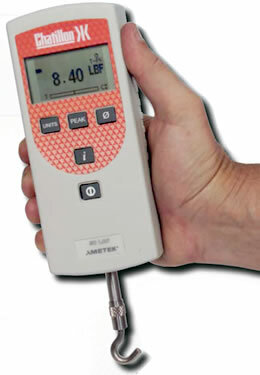 The DFX Series can also be supplied with an optional Certificate of Calibration with NIST data.